SPOTTING SCOPES are a little like two-car garages. Before you get one, you don't know just how useful they could be, and after you do, you wonder how you ever got by without one. Just as every serious gear junkie needs a place to store tools, treestands, and croquet sets, serious hunters and shooters don't know what they've been missing until they use a spotting scope to assess distant antlers and targets. As with storage space, first-rate spotting scopes are an investment. You can expect to pay a few thousand dollars for the best long-range optics, and they tend to be worth it, because cut-rate spotters are rarely a bargain. Price isn't always the best measure of a scope's quality, though, as we determined in this year's optics test. You need to consider durability, versatility, and what we call "eye comfort," which is an assessment of how easy the instrument is to look through, whether you squint your eyes and fuss with the focus, or glass with eyes wide open, drinking in the image. Its an important consideration, because the more time you spend behind your glass, the more you'll see. This year's field of spotting scopes is easily the largest in the past several years. There are some very good ones that cost more than your best rifle or shotgun, as well as some bona fide bargains, along with some that simply don't deliver much performance for their price. Which is which? Read on. 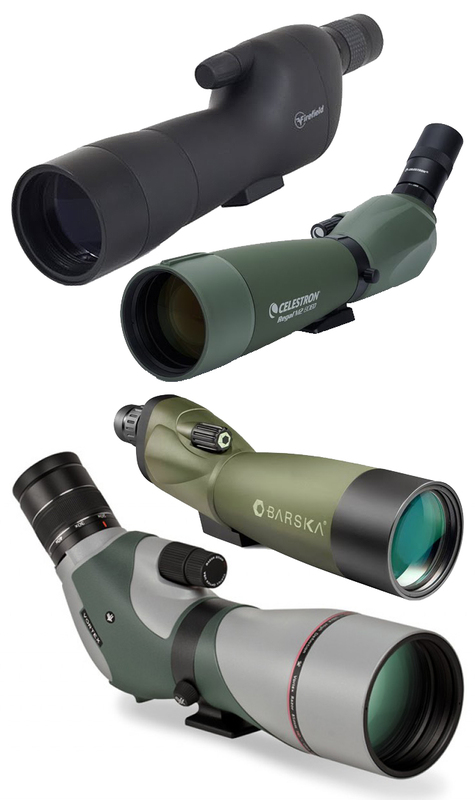 MOST HIGH-END Spotting scopes ship with a variable-power eyepiece that can be swapped out for a fixed-power unit (usually BOX) that's sold separately. The fixed-power eyepiece generally has better light transmission and field-of-view than the zoom. The problem is, few hunters actually buy the second eyepiece, so the versatility of the system is offset by the additional cost and dust-introducing components of the detachment mechanism. Meopta has addressed this problem with the MeoPro 80, a lovely 80mm spotter that has an integrated, non-removable 20X-60X eyepiece. The simplicity of the scope allows Meopta to bring the MeoPro to market at about two-thirds of the cost of its flagship spotting scope, the 82mm MeoStar S2. But we found the MeoPro has nearly identical optical performance to its big brother. It was runner-up in the 12-scope field for low-light performance. The MeoPro, assembled in the U.S. with Czech components, wowed the test team with its edge clarity, brightness, and durablity. In a competitive field of high-power units, the Meopta was the spotter that testers reached for most frequently when they wanted to glass bull elk on a mountainside miles away, or to assess hits on our 600-yard rifle target. MAVEN, THE WYOMING-BASED company that pioneered the direct-to-consumer sales model with binoculars last year, adds this spotting scope to its lineup for 2016. The same excellent optics, tight controls, and customizable exterior that defined Maven's freshman effort all characterize the spotting scope. It should be noted that the unit we tested is a prototype, and it looks pretty generic. Buyers will be able to dress up their S.1A by picking elements from an online menu that include camouflage patterns, colored focus rings, and eyecups. IT'S FAIR TO SAY THIS WAS the surprise of the spotting scope category. Based on its ostentatious logos and derivation, many on the test team dismissed this new brand as just another forgettable made-in-China optic. Then they glassed distant elk with it. The Athlon is very sharp, and we loved its tight, positive controls. Our only ding is that the image is slightly darker than that delivered by its peers in this full-size class. That's not a big consideration if you're glassing in the middle of the day, but it was noticeable at twilight and during our low-light test, where the Athlon was one of the lower-scoring optics. Try as we might, we were unable to detect flaring or peripheral distortion. Mainly, we liked the Cronus' price. It's a big (4.2-pound) spotter built around a sharp-looking pebbled magnesium chassis. The two-speed focus is easy to use and the fine focus is very precise. In all, it's a ton of value in an optic that will be a worthy addition to your field or range kit. THE HEART OF THIS pricey optic is a first-plane illuminated reticle with MOA references. It's designed to be used by a spotter acquiring targets for his partner, who fires at those targets through a riflescope sporting an identical reticle. It's a niche optic - designed for shooting rather than game viewing—and while the reticle is invisible when the illumination is turned off, the extra lenses required for the sighting system helps explain why the normally high-performing Swaro turned in middling optics scores. Hits included the excellent hinged lens cap and wonderfully adjustable illumination. ANOTHER HIGH-VALUE, high-performance spotter from Alpen, the Rainier turned in a great resolution score and very good field images. and was in a tight race for our Great Buy award. At 4½ pounds, this is a big optic, but its 85mm objective is slightly smaller than the previous iteration of the model. The spotter features a pebbled magnesium body, a 45-degree angled eyepiece, center focus, and rubbery covers that work quite well to keep the dust off the well-coated lenses. It lost points on the subjective considerations of durability, versatility, and ergonomics. THE MICHIGAN COMPANY better known for its tritium-powered riflescope illumination system is now in the spotting scope business with this very good full-size unit. The angled HD scope scored near the top of both the resolution and low-light testing, and testers liked the two-speed focus system that allows viewers to sharpen images with just a small amount of fingertip pressure on the controls. Panelists grouped the Trijicon, Nightforce, and Minox into a subset of the spotting scope category, and while glassing bull elk on a distant mountain, the Trijicon provided the brightest image. A BIG 88M M OPTIC, the German-made Minox is designed so smartly that the lens doesn't appear as large as it is. The lustrous black body features an angled 20X-60X eyepiece, a well-engineered mid-barrel two-speed focus control, and a bayonet mount that accommodates most digital camera bodies, to enable the spotter to be used as a tele-photo lens. We expected the outsize objective lens to deliver more light, but the Minox 88 turned in only average low-light scores. And our sample exhibited surprisingly significant internal marring and dust. AN AGGRESSIVELY STYLED Spotting scope from a company that built its reputation on battle-hardy rifle-scopes, this optic—the sophomore spotter from Nightforce—delivers middle-of-the-road performance in a tight, field-worthy chassis. The team had mixed feelings about the tactical look and feel of the magnification and focus controls ("Over-wrought," said one; "Tacti-cool," wrote another), but agreed that the highly textured and immensely grippable controls were easy to use. Optically, the scope is fine, though the image was slightly milky at higher powers. THIS COOL LITTLE UNIT fits in the palm of your hand, and when its onboard gyroscope is powered on. it stabilizes the shakes and sharpens the blurs of any image. In that way, it's the full expression of SIG Sauer's "electro-optics" brand promise. But the spotter isn't really configured for sportsmen. Its magnification makes it a short- to middle-distance spotter at best. Is it designed for use at a shooting range? Maybe, but because there is no way to mount it on tripod, you're forced to hand-hold the Oscar3, limiting its utility, no matter what you might want to use it for. ITS HARD TO IMPROVE the basics of a sporting optic. Certain attributes—such as magnification, field-worthiness, and portability—can be tweaked, but not entirely redesigned without losing the functionality of the product, whether it's a riflescope or a spotting scope. But one of the most significant innovations in this year's field of optics is a new type of lens coating on Leupold's VX~3i riflescope. Called the Twilight Max Light Management System, the proprietary coatings are designed to reduce glare, boost the transmission of light on the edges of the visible spectrum, and increase low-light contrast. We didn't document significantly better low-light resolution, but we did notice very good contrast and image separation with the new system. Most important for hunters, we noticed that the crosshair is highly visible in dim light.